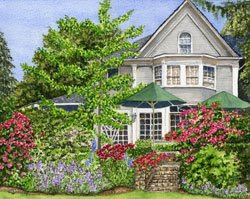 This painting, "The Garden at Hickory Hill" was painted during the Franklin Garden Walk in 2006. This garden was amazing and beautiful. I sat at one end of the Rose Garden at Hickory Hill, facing the house. In every direction I looked was a beautiful view! I really like to paint structures in the garden, so I chose the view with the house. I worked on this image all day. I took some reference photos to help me later when I completed the piece in my studio. I will be painting in the Franklin Garden Walk again this year on June 11th. I think this particular garden tour is one of the best in Michigan. If you love gardens you really will want to tour here in June! This tour is very well organized and the garden club members host a salad luncheon in the middle of the day, which is also wonderful. Most of the gardens will host artists, myself included, during the tour. What fun for visitors to see these amazing gardens and enjoy a wide variety of artists using lots of different styles and mediums! Visit my Events page on my website soon for more details!